Miki Pulley offers a turn-key option when Engineers are designing a complex mechanism requiring several facets of mechatronics and motion control. This is achieved offering a variety of combinations. Some complete with motor, reducer, clutch, and brake. Contact Miki Pulley for more information or request a quote today! The 125 model has a drip-proof, shaft-to-shaft construction enclosing the clutch and brake in a durable lightweight housing. This housing may be easily mounted with included brackets. Rotational power is applied to the input shaft and is transmitted to the output shaft continuously until brake is energized. The 121-20G model design has an open, through-shaft structure. Rotational power is applied to the input hub (via mounted sprocket). The through-shaft rotates until brake is energized. This configuration is highly resistant to radial loading, and is ideal for mounting V-belt pulleys or spur gears. The through-shaft construction allows for both, or either side to be used for output shaft. The 180 model is entirely enclosed, and adheres to JP44 JIS C4004-1980. This compact design delivers 50% higher torque than similar models. The air gap may be adjusted by loosening the locking bolt and turning the armature ring. No disassembly is required to make this adjustment. The mounting position may be altered simply by moving the terminal block to 4 equal 90 degree clocking locations around the axis. Two different center height levels (low and high) are available in the selection. 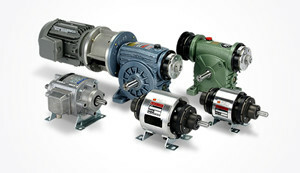 The 126 model is basically a 125 unit with a 3-phase induction motor included. Output starts and stops may be executed repeatedly without stopping the motor. The CBW model is a reducer with a clutch and brake mounted on either input or output sides. The output is performed by the reducer, while input rotation comes from a v-belt pulley installed on the clutch hub. Opposite the clutch hub is the brake. This combination reducer unit may serve a variety of applications, including a wide range of speed change, and a 360 degree revolution stop of the output shaft. The CMW model is an all in one unit. This includes a motor, reducer, clutch, and brake. This space saving design also is very easy to install. Connection is made by coupling the output shaft with the load side. The 122-G10 model features a clutch on both sides of the through shaft. This is the only difference from the 121 model. It can achieve 2-stage speed change, with forward and reverse. It has an open, through shaft structure. Rotational power is applied to the input hub via mounted sprocket. Configuration is highly resistant to radial loading, ideal for mounting V-belt pulleys or spur gears. The 122-G10 model features a clutch on both sides of the through shaft, and a brake on one side. This is the only difference from the 121 and 122-G10 models. Unique applications include precise positioning, high volume starts / stops, and high frequency forward, reverse / braking.